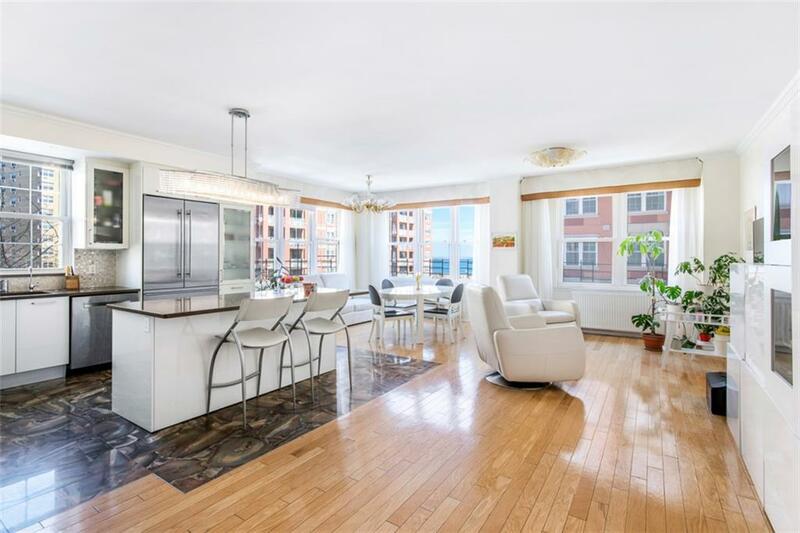 Tastefully renovated corner 3 br apartment with direct ocean views, brand new gourmet kitchen and central AC. Step into abundance of Light and Air and see the Ocean from every room! Apartment is facing South and East and is pi-drop quiet. 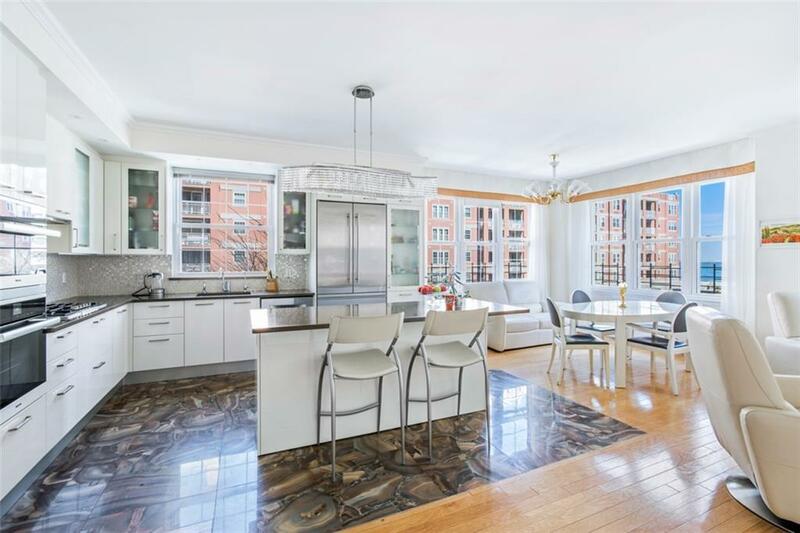 Large living room has four big windows and features thoughtfully renovated open-layout kitchen layout that could make any chef jealous, equipped with top of the line Miele, Bosch and Liebherr appliances. Kitchen has a gorgeous island with granite countertop, beautiful Italian tiles, double-wide refrigerator, 6 burner cooktop and even a steam oven, as well as plenty of cabinet space. Dining area with direct Ocean views would make any dinner taste much more enjoyable. One of the best and unique features of the apartment is a large double- length terrace, facing the ocean to the South, where you can relax, enjoy bird singing and beautiful sunsets. Apartment has 2 walk-in closets and 2 floor to ceiling custom-built closets. Washer/dryer in the unit. New central AC and heating system. Walls are decorated with Venetian stucco accents. Last but not least, it is located in the most desirable 2nd line of buildings - away from the beach noises and is pin- drop quiet. Private parking spot available for $110K. Showings by appointment only. 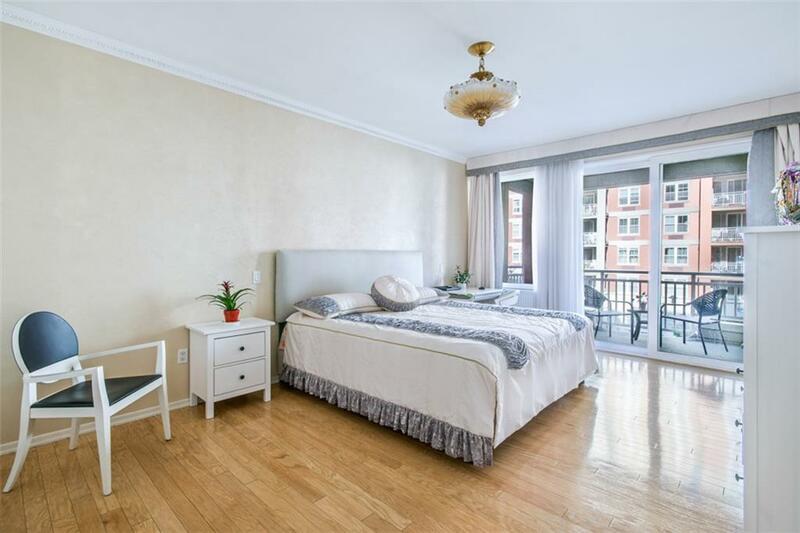 Tastefully renovated corner 3 br apartment with direct Ocean views, brand new gourmet kitchen and central AC. Step into abundance of Light and Air and see the Ocean from every room! Apartment is facing South and East and is pin-drop quiet. Large living room has four big windows and features thoughtfully renovated open-layout kitchen that could make any chef jealous, equipped with top of the line Miele, Bosch and Liebherr appliances. Kitchen has a gorgeous island with granite countertop, beautiful Italian tiles, double-wide refrigerator, 6 burner cooktop and even a steam oven, as well as plenty of cabinet space. Dining area with direct Ocean views that would make any dinner taste much more enjoyable. One of the best and unique features of the apartment is a large double- length terrace, facing the ocean to the South, where you can relax, enjoy the birds singing and beautiful sunsets. Apartment has 2 walk-in closets and 2 floor to ceiling custom-built closets. Washer/dryer in the unit. New central AC and heating system. Walls are decorated with Venetian stucco accents. 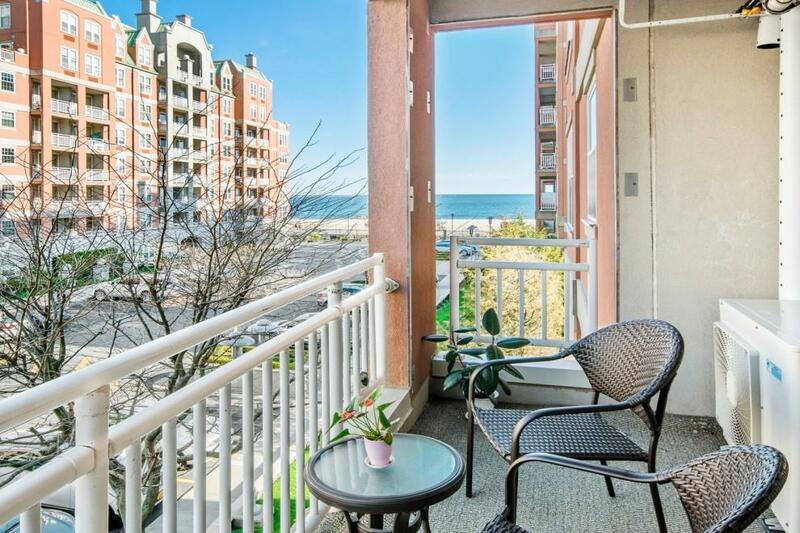 Last but not least, it is located in the most desirable 2nd line of buildings, which benefits from the Ocean views and at the same time is shielded from the beach noise. Private parking spot available for $110K. Oceana Condominium Complex includes Fitness Club, Business club, indoor pool & 2 outdoor pools, saunas & a playground. Showings by appointment only. Listing courtesy of Elena Ravich of Compass.